She has been doing her best to spark a little fire in me, to get me to add things to my Etsy shop. Monday I came home, and felt motivated! I created this fun collage sheet below. 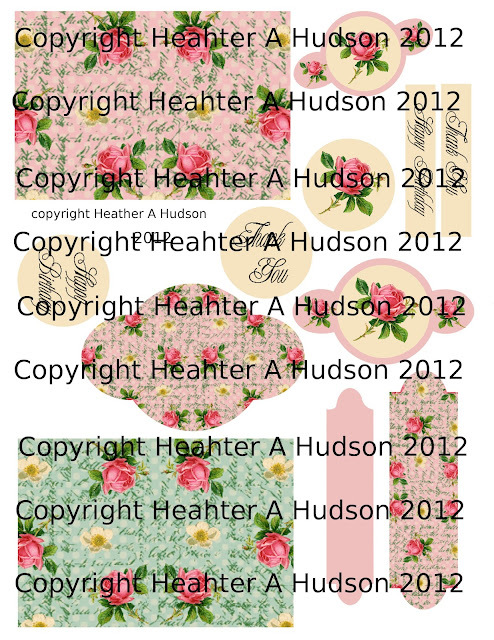 I created this collage sheet using images from Karen the Graphics Fairy. Yay! !, I have it in my Etsy shop! Here are two examples of cards that you can create using my digital collage sheet. I used value card stock in ivory for my card base. It measures 5 by 7 inches, so when folded in half it measures 5 by 3 1/2 inches. This will give you a 1/4 inch boarder left when you apply my digital base paper. I have added some basic sentiments "Thank you" and "Happy Birthday." They are both very "Heathery" if I do say so myself...lol. I used all the pink on this one. Distressed my edges, and inked with Ranger's Vintage photo. used pop dots to elevate the piece to tuck the Pro 31 Designs beaded trim under. I also used two of my favorite champagne flatback pearls, May arts leaf trim and Ivory mulberry roses on this one. I used the same embellishments, just more of them on the card below. I did add some tiny pink roses from my stash. I love how vintagey...and shabby chic these turned out! I even did a video, showing how I created the pink card. You can see it below. Please go and visit my Bff Ginny's so you can see the fabulous flower (it is fabby)...and card she made using one of my background images. So shabbeautiful! Love both cards! You know I love your collage sheet! That paper is gorgeous! Love that your cat came to visit, one of mine laid on the back of the couch and listened to you, lol! Love your sheet!